As industrial automation continues to develop and make processes such as scanning, packaging, shipping and assembly more efficient, Comtrol’s products have provided the connectivity required to integrate crucial elements in the automation system. In conjunction with Compunetics Systems, a Michigan-based company specializing in automated data collection; Comtrol has contributed to a comprehensive communications solution specifically designed for bar code scanning. Compunetics has developed a custom enclosure containing Comtrol’s DeviceMaster® UP and an internal voltage converter to power the scanning system and convert ASCII serial data from the bar code scanner to EtherNet/IP, PROFINET IO or Modbus/TCP (industrial network protocols) for the end programmable logic controller (PLC). As seen in the diagram, the enclosure has three ports, enabling an RS-232 serial connection, a 24VDC power supply connection and an Ethernet connection. Twenty four volts of direct current power are delivered into the enclosure; once inside the enclosure the standard 24VDC of power is stepped down to five volts where +5VDC is wired into pin nine of the serial port, easily powering the attached scanner. The DeviceMaster UP industrial Ethernet gateway has a flexible power input of 5-30VDC thus allowing performance on the enclosure’s five volt circuit. This serial power delivery eliminates the need to introduce an extra power supply for the bar code scanner. 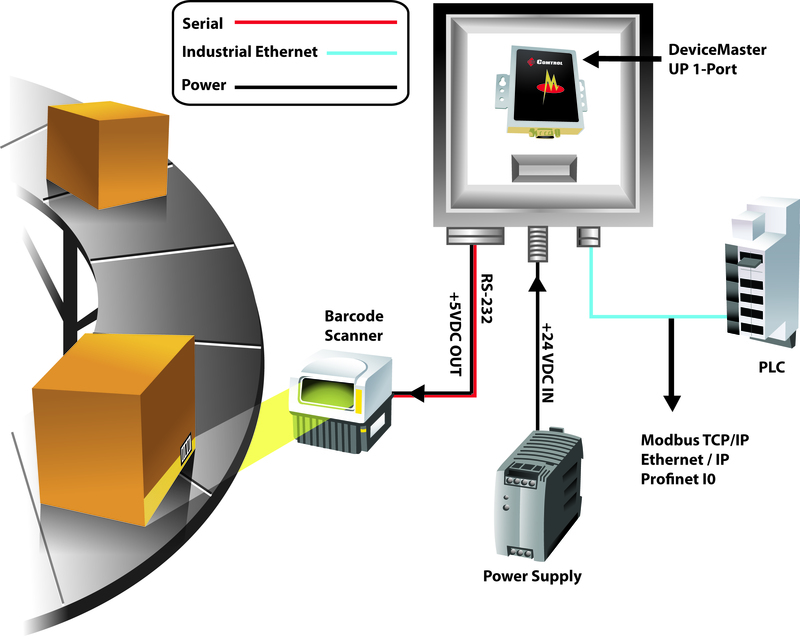 The bar code scanner then sends information and process data back through the serial connection to the DeviceMaster, which routes the information over Ethernet (EtherNet/IP, RROFINET IO or Modbus/TCP) to a PLC. This joint industrial hardened solution not only enables the automation system, but the enclosure decreases necessary cabling and is customizable upon customer request. Installation is easy; all that is required is the enclosure, a 24VDC power supply, Ethernet cabling, DeviceMaster UP configuration and scanner connection. Comtrol’s DeviceMaster UP is designed to provide innovative PLC to device connectivity. The DeviceMaster UP provides EtherNet/IP, Modbus/TCP, Modbus RTU/ASCII, and PROFINET IO connectivity to a wide variety of devices. A highly advanced raw/ASCII device interface functionality simplifies PLC programming and ensures robust operation. These features greatly simplify connecting devices such as bar code scanners, RFID readers, weigh scales, vision systems, printers, encoders and sensors to PLCs. The DeviceMaster UP’s many unique features provide connectivity options and flexibility not provided by other gateway products.